This program is mandated by the 22nd Judicial Circuit Court of McHenry County. being of their child(ren). The program assists parents in developing solutions to common and unique dilemmas faced by families during this process of change. Parents will have the opportunity to learn effective ways of communicating with each other and learn to make decisions that are in the best interests of their child(ren). 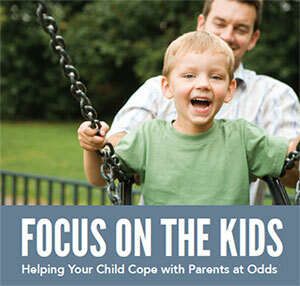 Designed as a four-hour educational class, Focus on the Kids seeks to assist parents in understanding and responding to the needs of their child(ren) and to help their children cope with their feelings. Note: This program is designed to offer parents the opportunity to learn about, and discuss the effects of divorce and separation on minor children. This class is intended to educate parents not counsel them. The class is mandated for any parent in the process of divorce or who is involved in after-divorce proceedings in which there are minor children involved. Parents involved in parentage actions, and ordered by the court must also attend. Course fee is $90 per person (materials included) and is due in full at the time of registration. In person, bring your completed form to McHenry County College’s main campus Room A258 Registration Office where you may pay with cash, credit card, debit card, or money order. Checks are not accepted. Phone with credit card or debit card information: (815) 479-7591. When you complete the class, we will communicate your attendance to the Court if you have registered with a case number. If you register without a case number, it is your responsibility to file your certificate of completion with the court. You will be charged a $15 fee for replacement certificates. Participants must be on time for each session. Latecomers will not be admitted to class. It is court mandated that parents can not attend the same class. Children are not allowed in the class. Please make childcare arrangements. Each reschedule will result in a $25 reschedule fee. To reschedule call (815) 479-7591. PLEASE NOTE: Participants must complete the program within four months of their start date, or MCC may require that participant pay the registration fee in full to re-register. All program facilitators are mental health professionals with a master's degree in the field of mental health or attorneys who specialize in divorce cases. All facilitators have extensive experience in dealing with divorce and its effects on children. For information or to register for this valuable class call (815) 479-7591. The Judges of McHenry County are concerned for the welfare of children of divorce and separation. They have made attendance at this program mandatory for all parties in dissolution or post-dissolution proceedings who have minor children.